Five professional cookery students from South Eastern Regional Colleges Lisburn campus have returned from an unforgettable trip to the historic city of Valencia, Spain thanks to funding from Erasmus+ VET Mobility project. 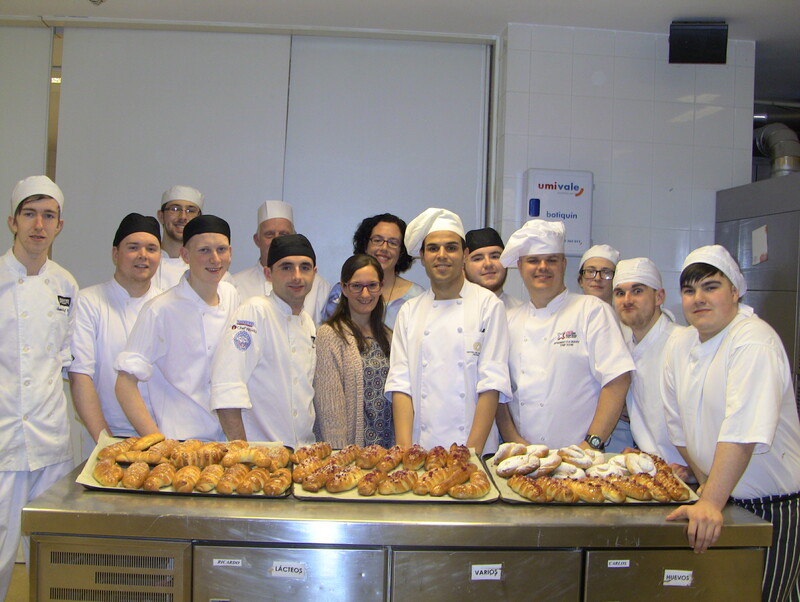 The group completed one week at partner college FEGREPPA, which specialises in patisserie, bakery and confectionery where they took part in intensive skills classes with the Spanish students and learned local speciality pastries and breads. During week two, the students were placed in pairs in patisseries and bakeries and were tasked with preparing doughs, baking a range of breads, rolling croissants, and decorating delicate and technical desserts and sweets. The language proved challenging for our student-chefs and although they had some Spanish language sessions before departing, there was a lot of gesturing and online translation used. Outside of work the students got the opportunity to experience the City, taking a walking tour, sampling tapas, visiting the Central Food Market and Albufera Natural Park, and they had the privilege of meeting Michelin starred chef Ricard Camarena who has a number of restaurants in the City. Lisburn cookery student Shauna McAleavey from Banbridge said “I didn’t have much experience in bakery and pastry so I jumped at the chance to attend the College in Valencia and then work in the industry. I learned so much. My technical knowledge and skills have definitely improved and I feel more confident having had this experience abroad. I now want to learn more and have enrolled onto SERC’s Patisserie and Confectionery course to help me improve”. The project funded by Erasmus+ and supported by the European Commission which is running for 2 years. Photo caption: SERC professional cookery students from Lisburn have returned from an unforgettable two week placement to the historic city of Valencia, Spain thanks to funding from Erasmus+. The group completed one week at partner College FEGREPPA, which specialises in patisserie, bakery and confectionery where they took part in intensive skills classes with Spanish students.